The best thing as far as I am concerned about handmade jewelry is the freedom to do anything you want...within reason. So I like to make fun designs like vases of flowers. I've done this before. 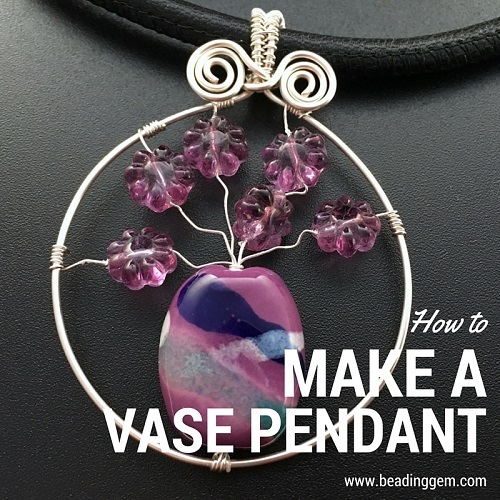 This time, I have adapted the tree of life design idea and made it into a wire vase of flowers pendant. Here is the basic tutorial. 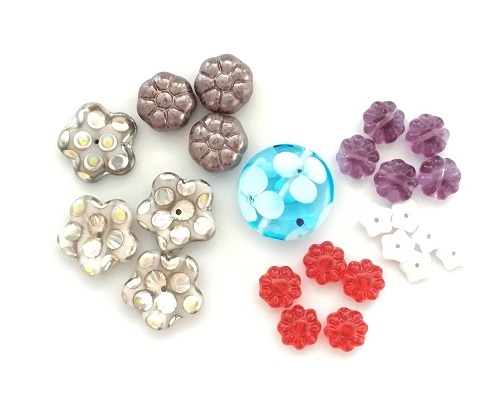 Choosing the right beads is the first order of the day! 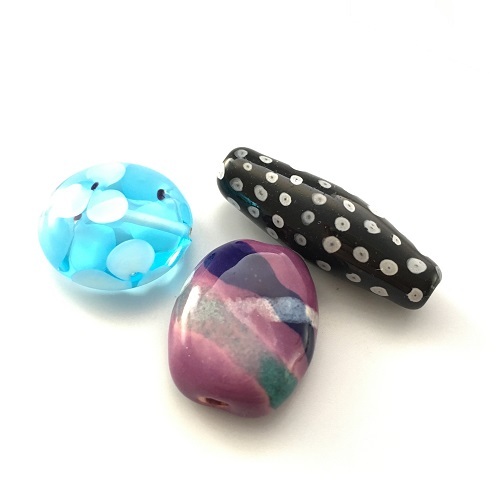 Pick bead shapes which remind one of vases. The Kazuri ceramic beads (black and purple ones above) had larger holes which allows for the passage of several wire lengths so they are perfect as vases. 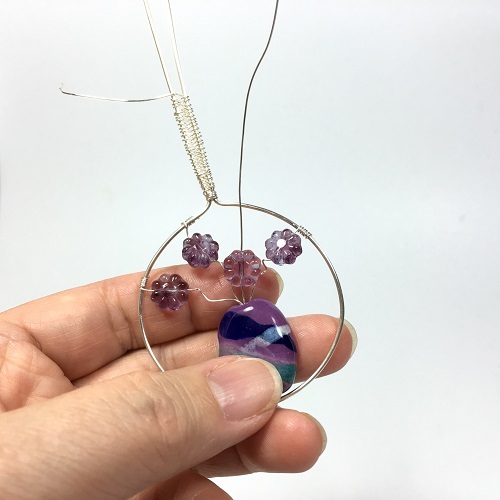 You can use any flower beads - it will depend on how large your pendant is going to be and how you want the final design to look. Use any suitable cylindrical mandrel. 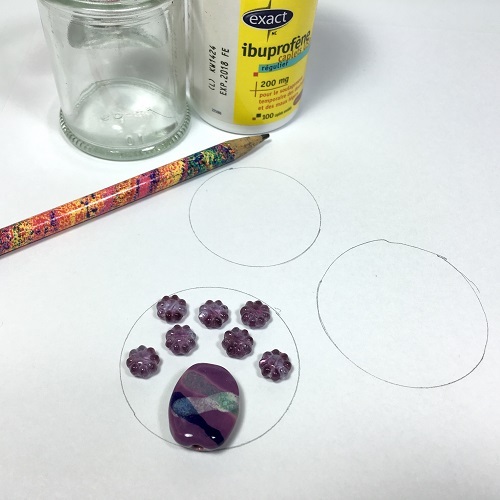 It helps to draw their basic shapes on paper and then play with the beads and see how they fit within the circles. I chose this small round bottle as my mandrel. Cut about 1 ft of 18 G and wrap it around the bottle. 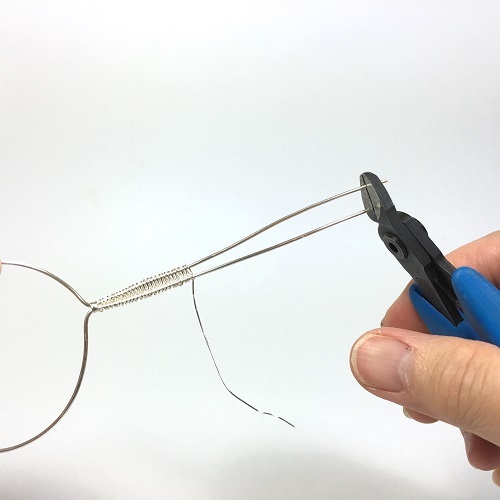 Use your chain nose pliers to bend the wire lengths up in the same plane as the circle. 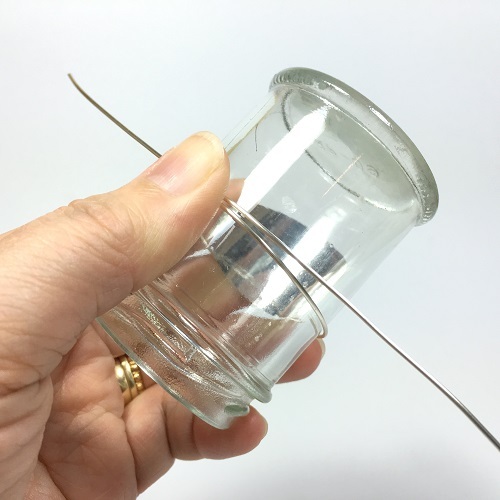 Working from the spool of 26 G wire, wrap the bottom of the uprights a few times. There should be a tail of about 1 inch or so on the left. Then wire weave the two upright wires. Use a 1 by 1 figure 8 weave. Basically, take the weaving wire and feed it from the outside to between the uprights. Bring it up on the outside of the other upright and back between the uprights again. Repeat for about 1 - 1. 5 inches depending on how large you want your bail to be. Cut the weaving wire leaving a 3-4 inch tail. Trim the beginning tail and tuck in the end with your chain nose pliers. Trim the upright wires so they are even. Generally, half hard wire is best for forming frames. But as the wire I used is soft, it is imperative to work harden it (hammering) so it stays in shape. Now comes the fun part. You can wire up the flowers and "vase" in different ways. 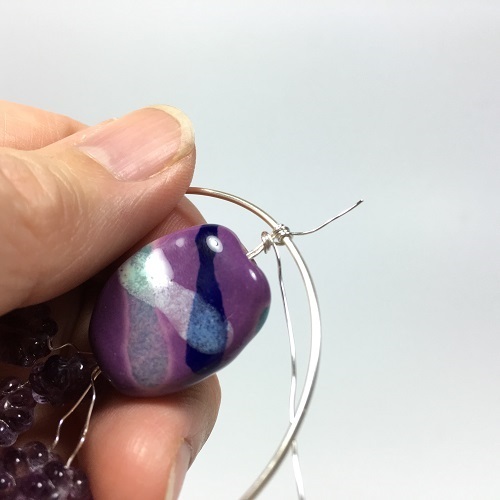 This is how I did it for the purple pendant. Cut 2 lengths of about 9 inches of 26 G wire. Wrap on end around the frame near the bail. Trim and tuck in the wire ends. 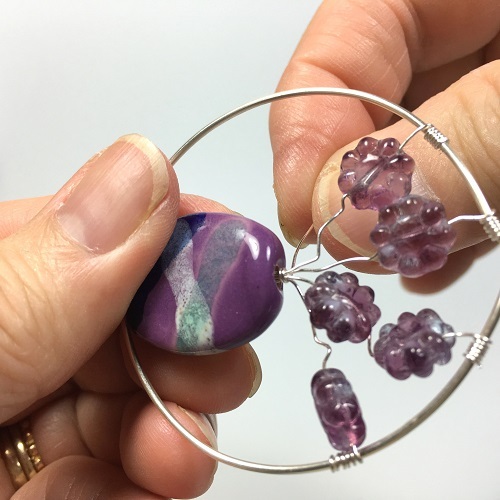 Then feed each wire through a flower bead and the "vase". Then wrap each wire around the frame as shown below. 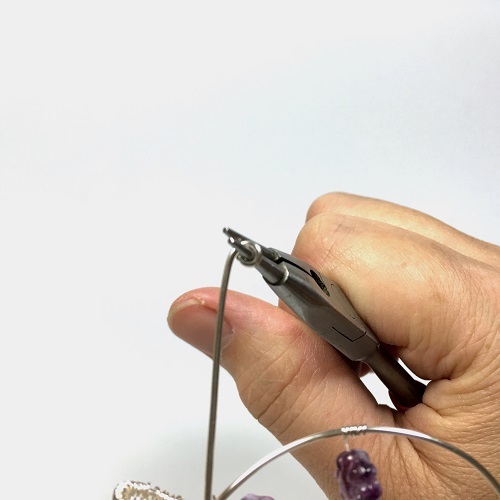 To make the flowers stay in place, use your chain nose pliers to add kinks or bends to the wire above and below each flower. Bring those wires through the "vase" again and add more flowers. End those wires by wrapping around the frame at the top. Trim and tuck. 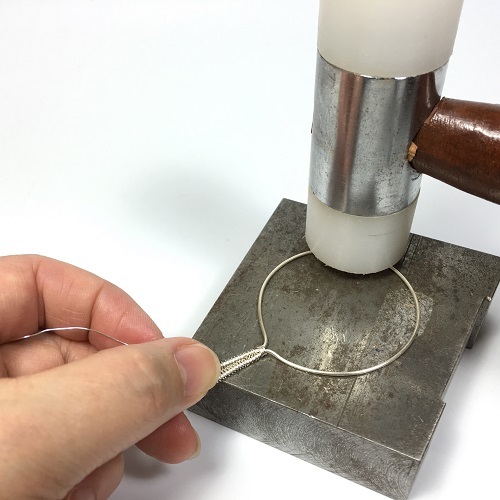 If you need to add more wire wire, start wrapping another length at the bottom. I only used one extra wire length of about 5 inches, so I trimmed off one end after wrapping at the bottom. If you need two extra wires for flowers, use and center 9 inches and wrap around the bottom. 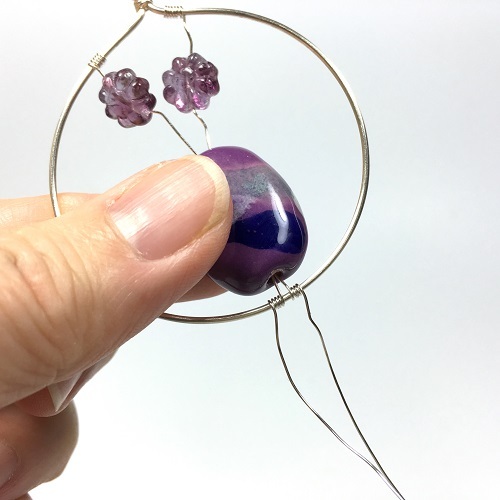 I also used the extra wire to wrap at the top of the "vase", then added another flower bead and wrapped around the frame. Trim and tuck. Take your chain nose pliers and place it at the spot where the two uprights begin. Bend the uprights so they are about a 45 degree angle to the plane of the circle. Then use the bail forming pliers or a pen to form the bail. 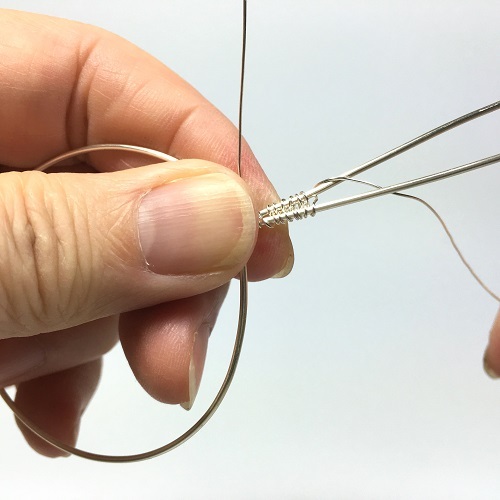 If you need to wire weave a little more, do so. You can see I bent the remaining unwoven parts of the uprights sideways. These are then used to wrap around the base of the uprights. Make sure the wires are of the same length before scrolling them. I also made my own cord ends, jump rings, and clasp using 16 G wire. See the links below for the how-tos. I used my large bail forming pliers for doing this. The flowers will spin making this a kinetic design. 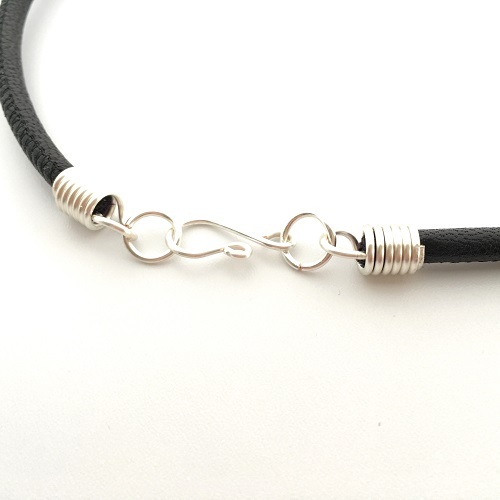 You can vary the shape of the pendant - to square, rectangle or even that of my next design below. 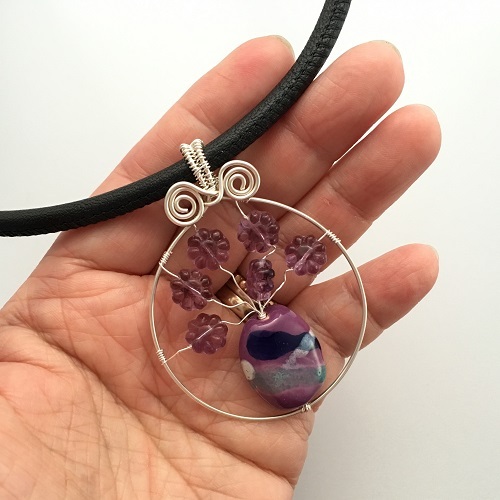 Some flower beads have center holes like the white ones used in this uniquely shaped pendant. So I used tiny seed beads for the center. Just feed the wire up through the hole, thread on a seed bead and go back down through the hole. I also used 24 G wire for the flowers. Otherwise the vase pendant construction is the same. All final photographs were taken with my iPhone 6S with the camera+ app and the Modahaus photo studio in natural light. The tutorial photos were taken using artificial lights (daylight CFL lamps) in my windowless basement studio. Click here for more information on my How to Photograph Jewelry Webinars - will resume in January 2016. Those are absolutely lovely Pearl - and very unique! I think the vase idea is brilliant!! As I was scrolling through and scanning - I thought - Oh No!! Is this going to make my head ache?! Hahahahahaha!! The elongated vase pendant looks very lovely on old Bertha btw! Yeah - Bertha still has no clothes! LOL! Check the link I gave to show other vase jewelry ideas. 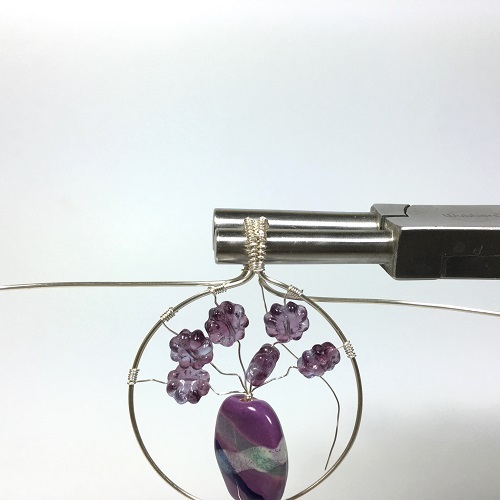 Love this, but will the 26 gauge wire hold its shape under the flowers? Just wondering. Yes. So long as the flower beads aren't too large. You can also up the thickness to 24 G as I did for some of the wires in the red and black design. 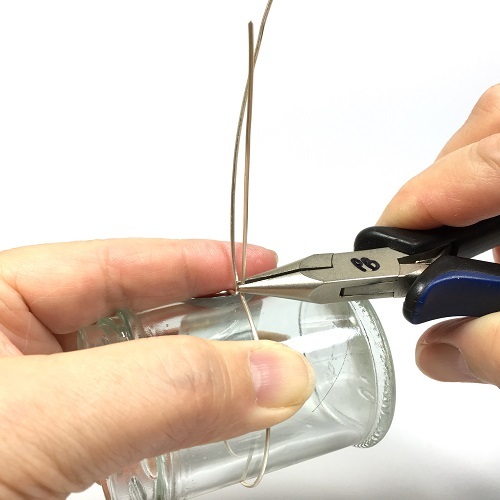 You must bend the wire before and after each flower to keep it in place. Thanks for another great tutorial, Pearl! In all tutorials, apart from the unique ideas, I value the simple tips like placing your design in the drawn circle, for instance :) Simple but valuable. :-) I share the tips so the learning curve will be less steep for readers everywhere! Not to mention save time and materials. I love this tutorial. I love the Tree of Life no matter how it's done but yours is so unique. I'm news to wirewrapping but I can't wait to try this. your directions are clear and concise. Thank you!! !